Though it is a song I have always loved since I can remember, it also was part of my life, living in the Shenandoah Valley, or becoming a folklorist, even being a saillor, and during one period of my life, performing on tall ships. 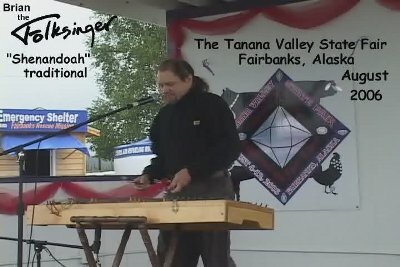 More specifically, however, I am at the Tanana Valley State Fair again in 2006, and people know me. I play the mainstage many times during the fair, and choose different themes for a show, since I don't use set lists. This time I was doing all the various requests from different people, from the security and staff, to vendors and booth people, sound techs and other performers. This one was requested by the people running the school bus driver recruiting booth, and I was happy to play it. They aren't far from the main stage, and you can see me looking their way just as I start to play. This entry was posted on Monday, March 22nd, 2010 at 3:19 pm	and is filed under Music. You can follow any responses to this entry through the RSS 2.0 feed. Both comments and pings are currently closed.